Dimensions 36'10" by 29'11" by 11'5"
Power plant 1 1470 hp (1096 kW) Rolls-Royce Merlin 45 vee-12 liquid-cooled engine driving a three-bladed propeller. The Mark I was equipped with a 1030hp Merlin II and four .303 Browning machine guns. The IA upgraded to eight machine guns and a bulged canopy.The IB had two 20mm Hispano cannons and four .303 machine guns. The IIA had a 1175hp Merlin XII and eight .303, while the IIB was armed with two 20mm cannon and four .303. The IV was an unarmed photoreconnaissance plane. The VC was armed with a modular wing that allowed a choice of guns plus two 250lb wing bombs. The VI was a high-altitude interceptor using a 1415hp Merlin 47, pressurized cockpit, two 20mm cannon and four .303s. The VII used a 1660hp Merlin 61 with two-stage supercharger. The VIII was basically an unpressurized VII. The IX was basically a V with the Merlin 61 and a four-bladed propeller, pushing the speed up to 408 mph. It was developed specifically to counter the FW-190 in Europe. The XI was a photoreconnaissance version using a 1760hp Merlin 63A; the X was a pressurized version of the XI. The XII had a strengthened airframe and a 1735hp Griffon engine. It was designed to be very fast at low altitude (372 mph at 5000 feet). The XVI had a two-stage 2050hp Griffon Mk 65 engine and was typically armed with two 20mm and two machine guns. The XVI was a IX with a 1705 hp Packard Merlin 266. The XVIII was derived from the XIV and carried more fuel. The XIV had a Griffon engine driving a five bladed propeller. It could reach 448 mph. The Spitfire is the legendary plane that won the Battle of Britain. 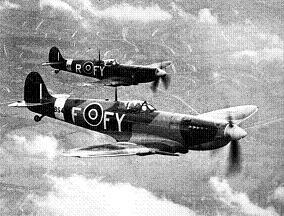 Though more bombers were brought down by Hurricanes, the Spitfire was better able to mix it up successfully with the German fighters. Thus, when the first Spitfires arrived in the Pacific, their pilots, many of them aces, were confident that they could take on the Zero. However, casualties were initially heavy until the Spitfire pilots learned to respect the Zero and avoid taking it on its own terms. The Spitfire also was handicapped in this theater by its rather short range, acceptable for Europe but not for the far reaches of the Pacific. The prototype first flew on 5 March 1936, and the first production aircraft were ordered three months later. The design was very advanced for its time, and proved sufficiently adaptable to remain in production throughout the war and into the postwar era. A total of over 20,000 of all models were produced, more than any other Allied fighter.